We're back today with the second leg of our honeymoon adventures - Brussels, Belgium! 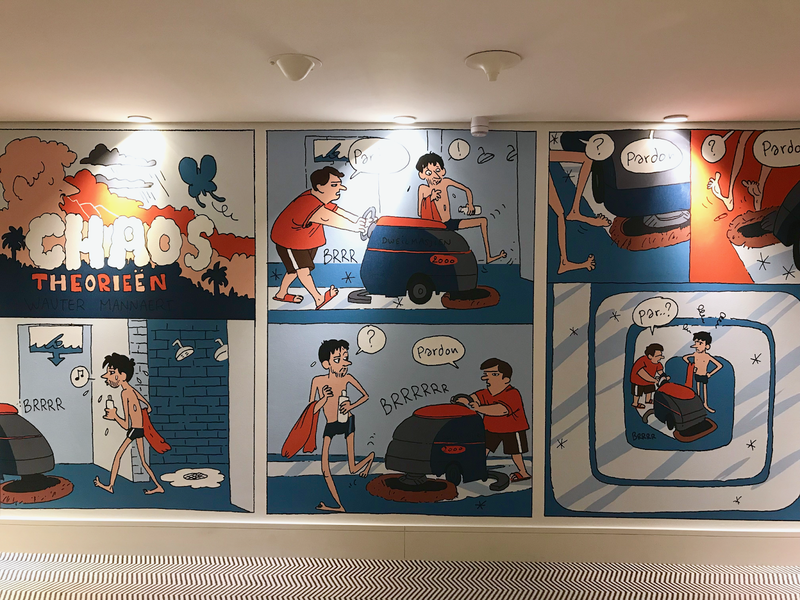 If you missed our post about Amsterdam, you can check it out here. To be honest, I don't think either of us would have really picked Brussels as one of the first cities for us to visit in Europe. We didn't really know anything about it, and we primarily picked it because it's perfectly situated between Amsterdam and Paris. As it turns out though, Brussels is great! It's small, but packed with plenty to see and do, and we ate some of the best food of the entire trip. 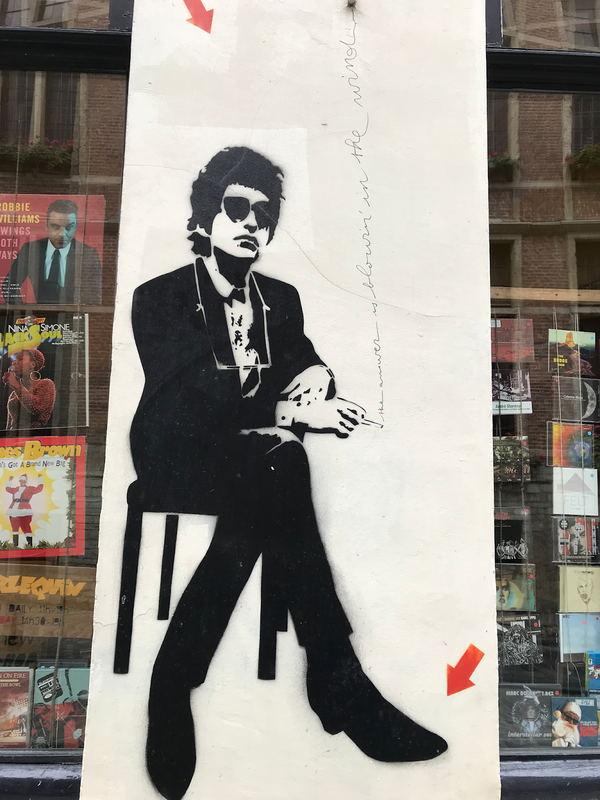 Here's a little recap of our time in Belgium. We took an early train in from Amsterdam and arrived to Brussels in the early afternoon. If you'll remember from our Amsterdam recap, I caught a cold pretty early in the trip and unfortunately it seemed to get worse as we got into Belgium. We checked into our hotel, the Radisson Red Brussels, which was truly amazing. 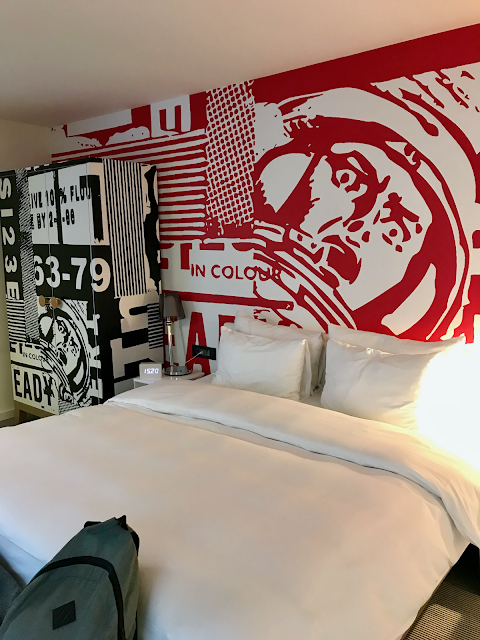 We had the best experience with our Radisson Blu hotel in Iceland last year and this Radisson hotel was no different. It's comic book/Alice in Wonderland-themed and everywhere you looked was perfectly decorated and colorful. We stayed in one of the corner rooms that had a huge curved window with views of the city. They were also the only hotel we stayed in that offered complimentary breakfast every morning - fresh baked croissants and other pastry goodies... so good. We didn't work with them on this trip, but damn I wish we had, because we would totally have moved in. Anyway, after settling in, we ventured out for an early dinner down the street at The Beer Factory. It was a good place to try a few local Belgian beers, but the food was pretty mediocre with little vegetarian options. 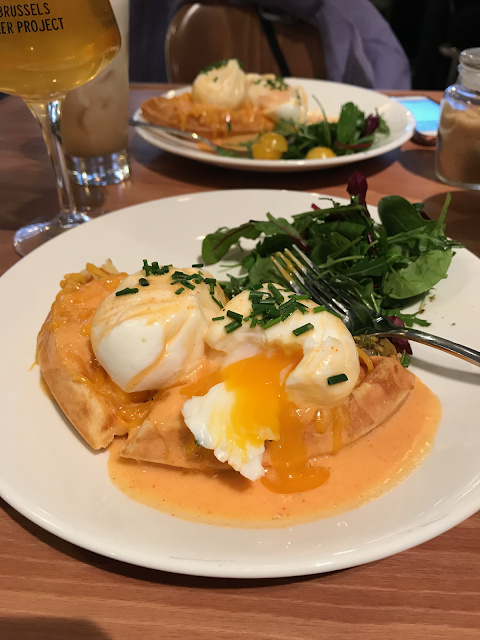 We probably would have ventured out further if I had been feeling better, but this was perfectly sufficient to fill our bellies. We stopped at a local grocery store for more Belgian beers to enjoy at the hotel that night and then stayed at the hotel the remainder of the evening. 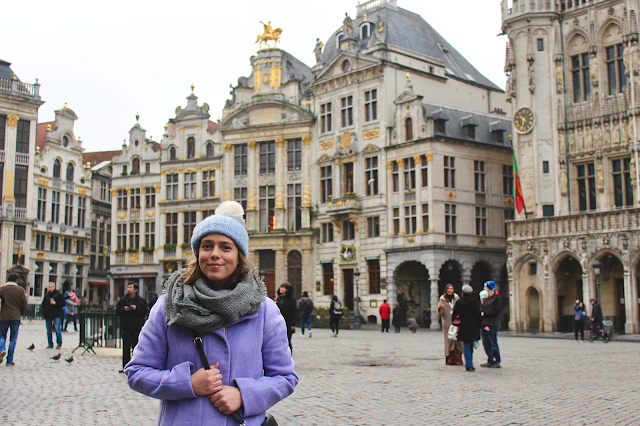 A quick and easy first day in Brussels! We woke up early on Saturday morning, debating whether or not we should go to Bruges, a beautiful town about an hour from Brussels. 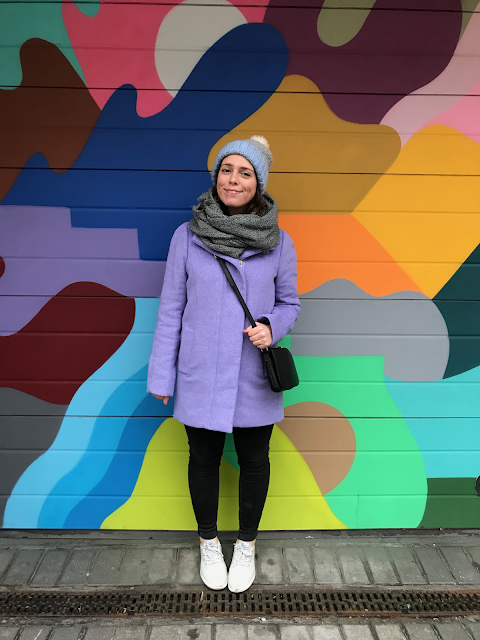 It was our tentative plan for day 2 in Belgium, but ultimately we decided more travel was probably not for the best since I was already feeling so sick. 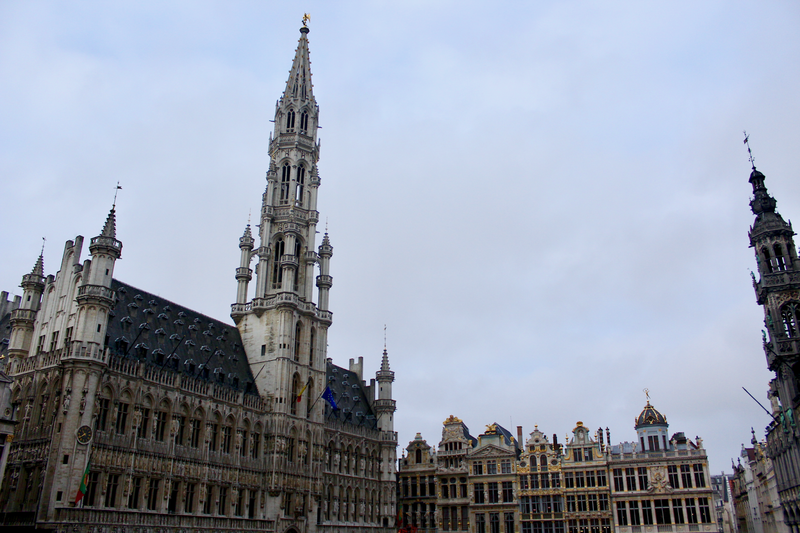 Instead, we grabbed breakfast at our hotel and walked into town to see Grand Place and everything Brussels has to offer. 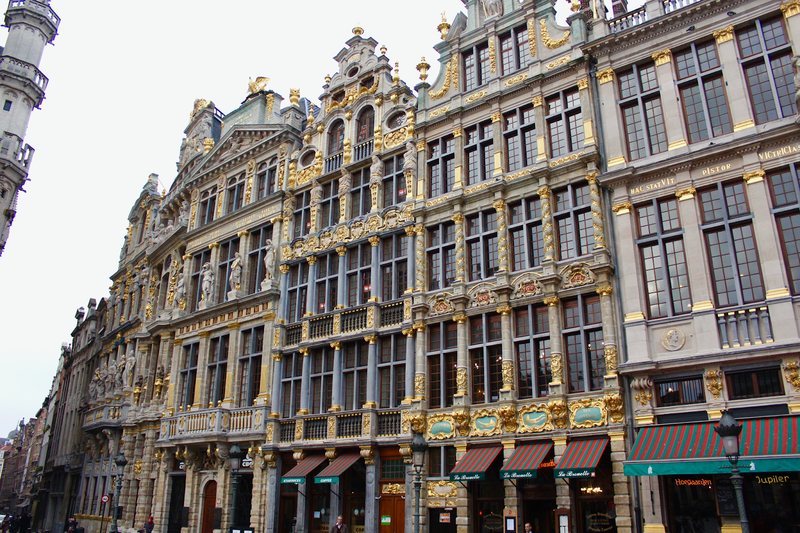 Grand Place is the central square of Brussels and is truly spectacular. Every building is so beautiful with the most intricate detailing - you could just stare at them all day. 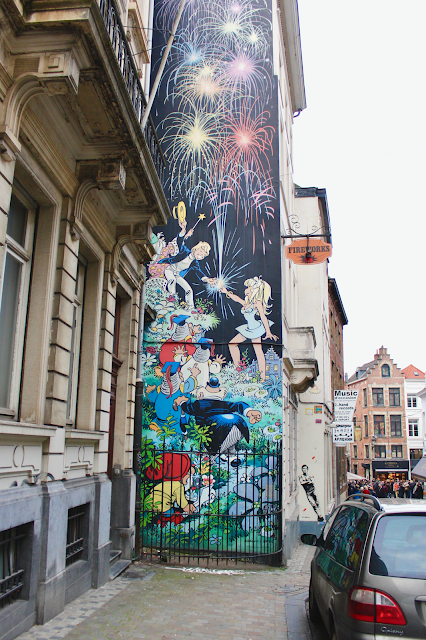 We walked around town for a little bit, admiring the murals and scouting out places we'd want to grab food later in the day. 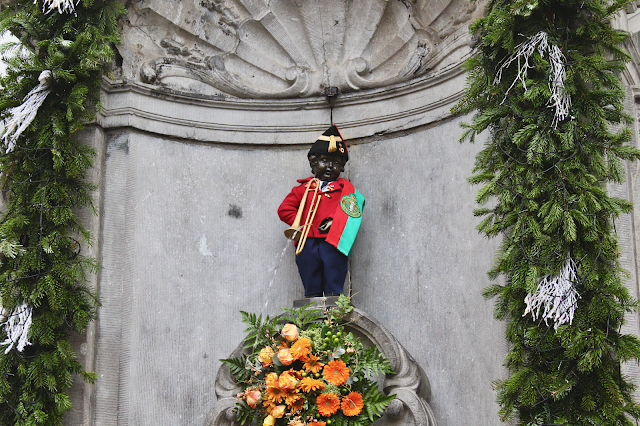 We went in search of Mannekin Pis, which is the famous statue of a peeing boy (yes, you read that correctly.) And finally when it was an appropriate drinking hour (although, we're honeymooning so I think any time is appropriate?) we visited Delirium Cafe for some Belgian beers. Belgian beer is not something Nick and I typically gravitate towards, but every beer we drank was so wonderful. Also, we realized that every bartender dips your entire glass into a bucket of water to ensure it doesn't get sticky with beer. Just an interesting little thing we noticed that we don't see in America. 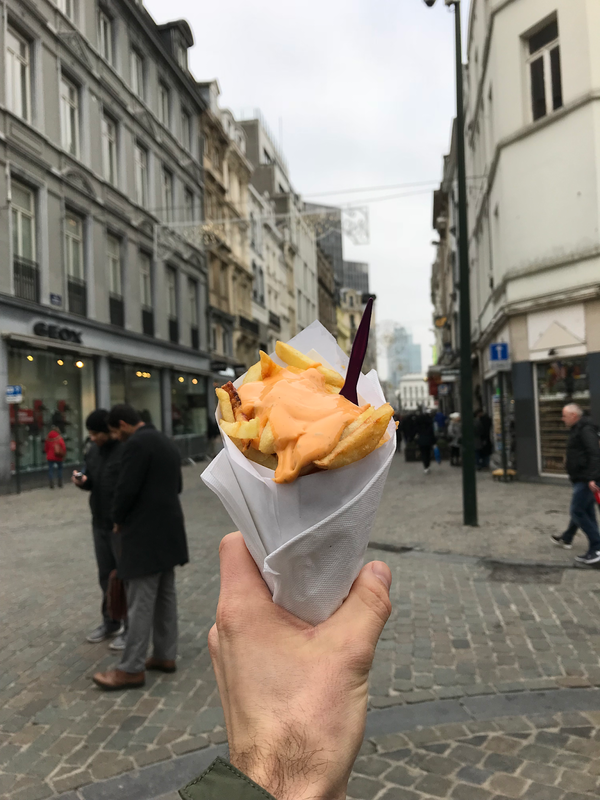 After drinks we headed back towards Grand Place to find a stand that had Belgian frites. 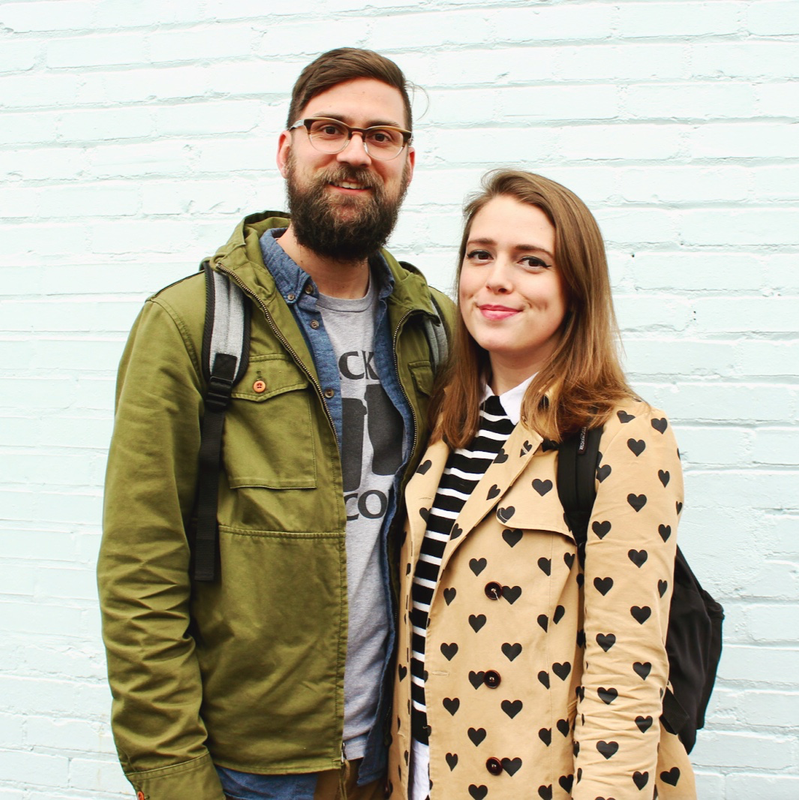 We found a small shop with a long line, so we figured it was one of the best. I ordered my frites with the traditional dollop of mayonnaise on top and they were fantastic. Nick ordered the Maffiasaus (mafia sauce), which he loved but was probably a little too spicy for me. We headed back to the hotel early and had some drinks at our hotel bar while we decided on our plans for the rest of the day and evening. Because we're incapable of going like two days without pizza, we decided to venture out for a couple slices of 'za as a late afternoon snack. Unfortunately, they were incredibly over-baked and nearly inedible, but it was nice to take a stroll around town. Later that night we ordered more pizza from UberEats and settled in for 6-hour binge-athon of The People vs. O.J. Simpson. For our last full day in Brussels, we decided to take the train to the Atomium Museum. 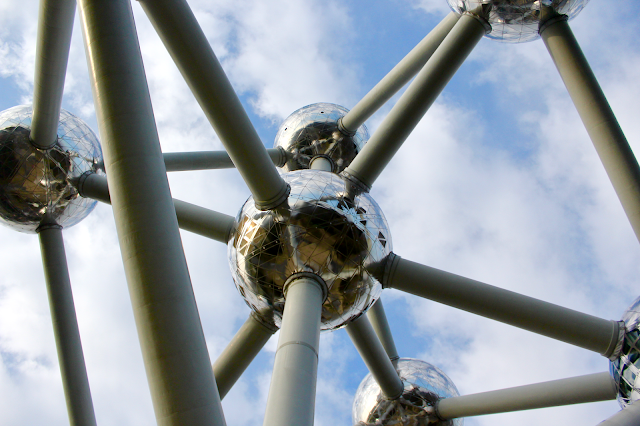 The Atomium is a huge building that looks like an atom (magnified by 165 billion) - it was built for the 1958 Brussels World's Fair and later turned into a museum. It was actually a really fun visit! 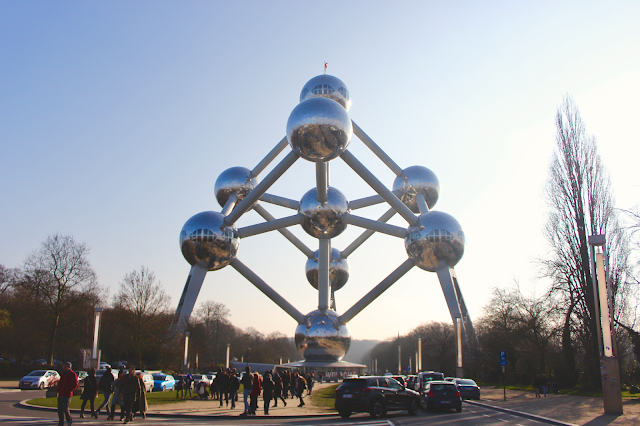 There are a lot of historical displays and art exhibits inside, and you can see panoramic views of Brussels from the top. 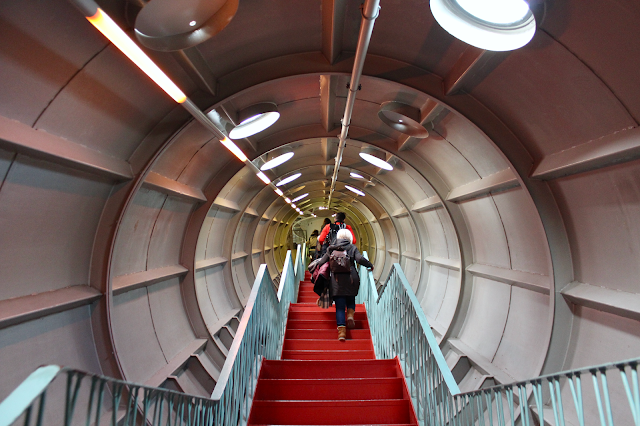 After checking out the Atomium for a couple hours, we took a train back into town and went to Peck 47 for lunch. This was the only restaurant of the trip that I planned to go to ahead of time and it certainly did not disappoint. Nick and I ordered the same thing (happens more often than it should) - poached eggs and cheese over a leek waffle. To die for. 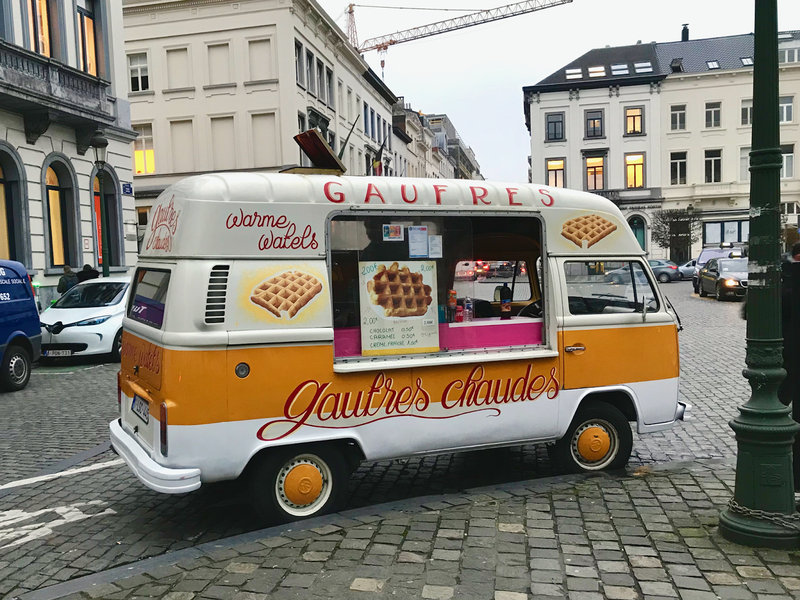 And because we hadn't had our fill of waffles yet, we stopped at a shop and got our first true Belgian waffle. Can you tell this was by far our best food day? We strolled around town a little while longer and later headed back to our hotel to settle in for the Steelers playoff game. We shared a cheeseboard (good) but the Steelers lost (bad.) All in all, Brussels is a fantastic city with great food, great beer, a great hotel, and a great peeing statue. 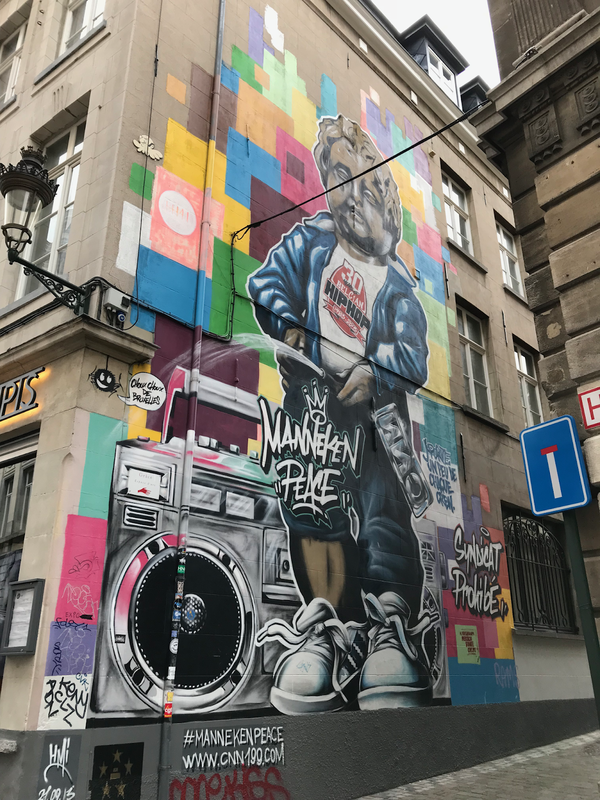 We highly recommend a visit on your next trip to Western Europe! And in case you want to see this trip in video form, we put my Instagram stories together below. One more leg of the trip to go and it's the big one - PARIS. Coming soon-ish.